A film which promises to kill off Gwyneth Paltrow after ten minutes is one that deserves to be watched – particularly when the rest of the cast consists of big hitters like Matt Damon, Jude Law, Kate Winslet, Laurence Fishburne, Marion Cotillard and the criminally underrated John Hawkes. Director Steve Soderbergh has marshalled such a talented ensemble to great success before: will Contagion emulate the success of Ocean’s Eleven or flop like its disastrous sequels? The movie opens with a sweating, coughing business woman (Gwyneth Paltrow) returns from abroad to her husband and family in Minneapolis. She’s carrying a lethal virus picked up in China - and dropping in on her lover in Chicago en route she begins to spread the infection across the USA. The pandemic takes root, Paltrow dies and the Centre for Disease Control, World Health Organisation and Homeland Security are called in. The action jumps from location to location as the authorities attempt to prevent the outbreak’s spread and dampen the growing sense of international panic. 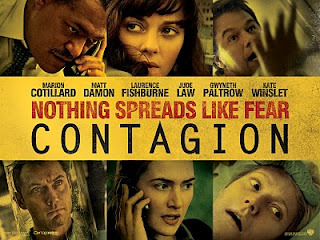 As you’d expect from Soderbergh, Contagion is extremely sick. Arguably its greatest strengths are kinetic sequences showing the transmission of the virus from one person to the next. Probably the greatest of these shows Paltrow’s character passing her infection around a busy casino: an environment the director has repeatedly proved himself comfortable in. The human drama of the situation is dealt with less capably. Matt Damon tries manfully to inject some gravitas into his schlubby grieving father, but of the ensemble cast he’s the only one really worth caring about. This is the fault of an overly-ambitious storyline which simply attends to too many characters in too many locations. A tighter focus on a smaller number of stories would have allowed deeper explorations of the more interesting characters: an entire storyline concerning Marion Cotillard’s WHO inspector could easily be culled with no detrimental effect on the movie. To be fair, Jude Law’s shifty medical blogger could quite easily have been cut out, too. He’s an irritant for both the authorities and the home audience – not least because of his dodgy and unnecessary Australian accent. If his role is to represent the world of technology and the way news (both true and false) spreads, then Soderbergh is over-egging the pudding. There are enough mentions of Twitter, Facebook and instant messaging as it is. To be so critical of the film is perhaps a little unfair. It’s a thoroughly engaging watch and features some strong performances and some notable twists and turns. Sadly, it feels slightly episodic thanks to the separate story strands which are not tied together as neatly as they were in Soderbergh’s Crash. Still, there are worse ways to spend an evening than in the company of a cast like this in a thriller which resonates with an audience familiar with health scares like SARS and H1N1.